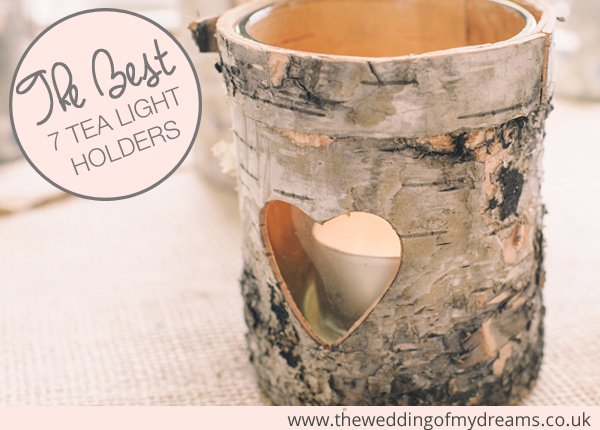 Are you looking for tea light holders for your wedding? 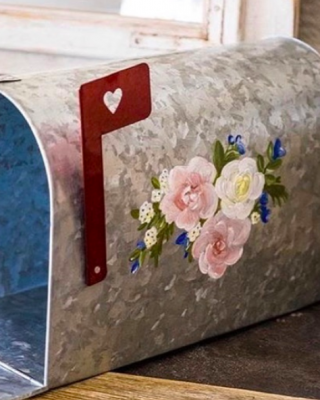 Something to suit your overall wedding style? 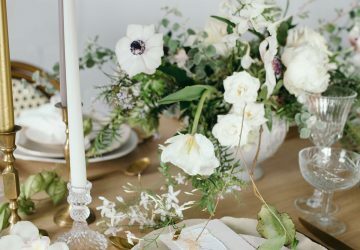 Here we have outlined our all time favourite tea light holders for weddings, all available to buy online. These tea light holders are made from natural tree bark, add a tea light to the holders and it shines through the cut out heart. 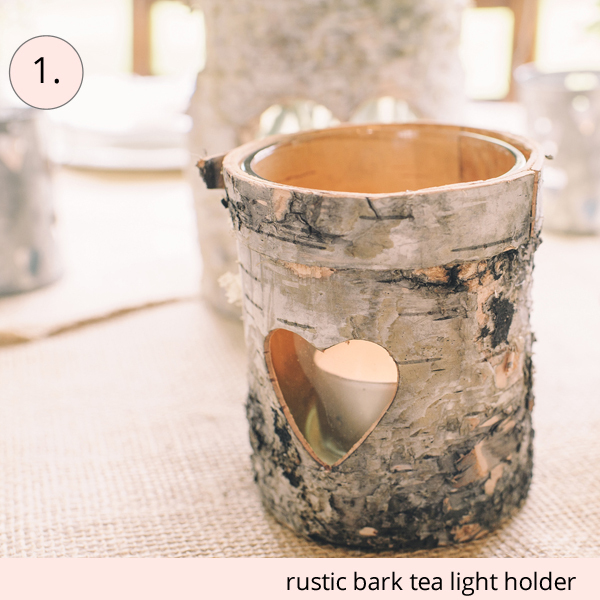 These tea light holders are perfect for adding a touch of rustic to your wedding decor or for a woodland theme. 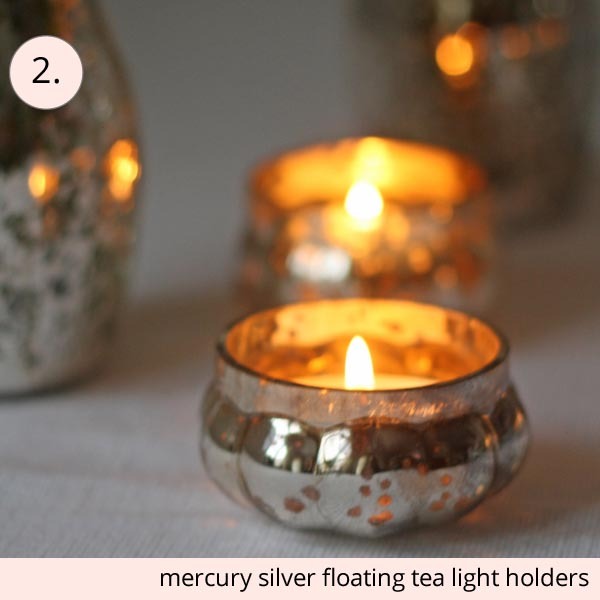 These are our best selling mercury silver tea light holders and are a steal at only £2.50. Once the candle is lit the light shimmers through the mercury silver glass. These tea light holders will also float if you place them in a dish of water, this could make a unique centrepiece. 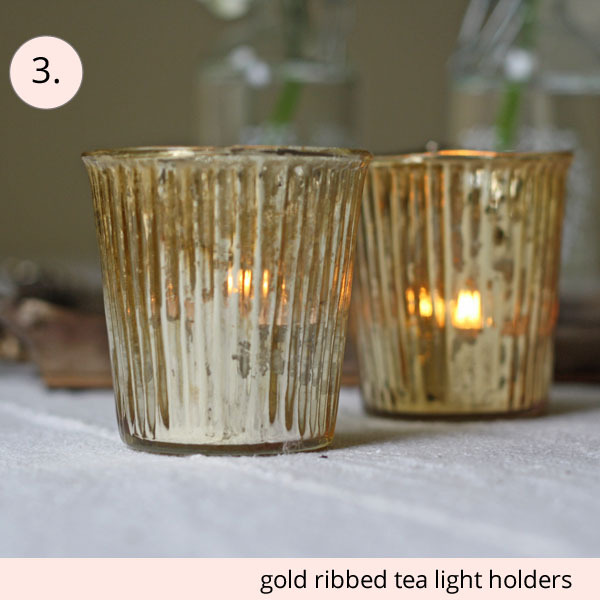 These are our favorite gold tea light holders, if you are looking for gold tea light holders these fit a standard size tea light and look stunning as the candle light shines through. 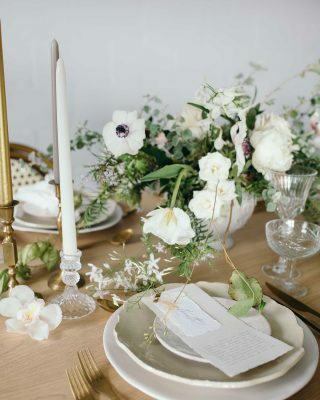 They would be lovely at weddings if you are looking to add a touch of gold to your decor for for a rustic glamour wedding. If you are looking for a plain yet sophisticated looking tea light holder our stylish silver and glass tea light holders might be for you. 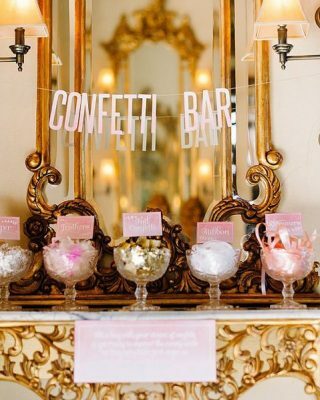 The clear glass lets the light shine out around the room and the silver detailing around the top looks stunning. For an off white natural looking tea light holder we love these. 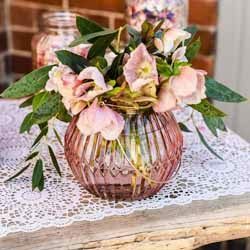 We call them our vintage country tea light holders as they work for both vintage style weddings and summer country style weddings. 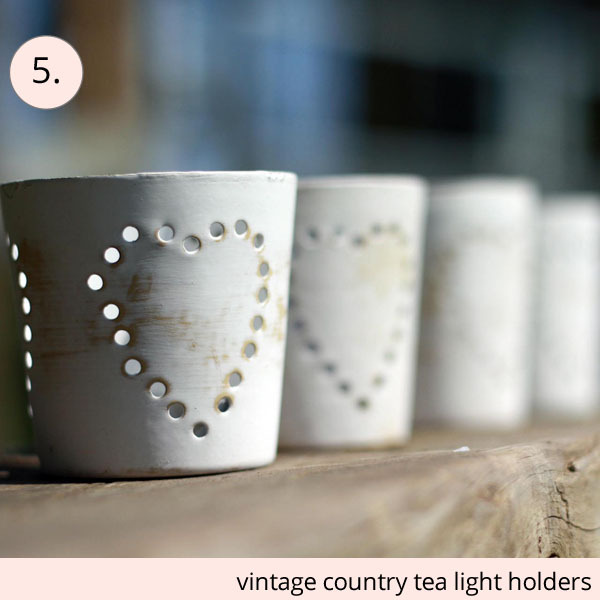 The tea light holders are natural cream in colour with a slightly distressed finish. 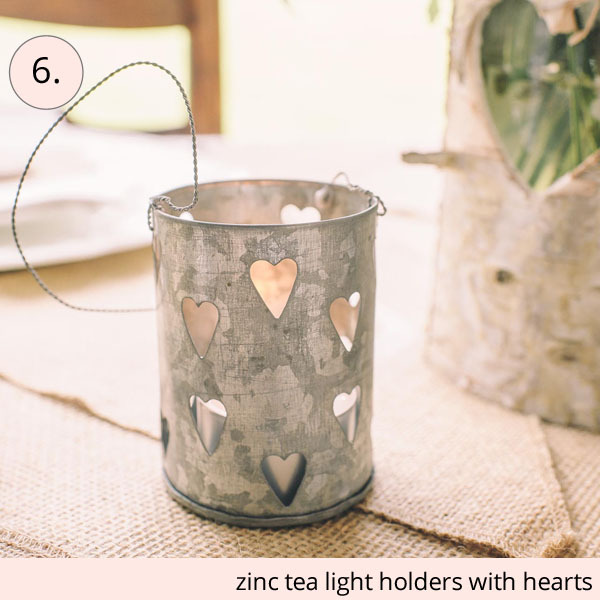 For a country style or rustic chic wedding these zinc tea light holders with hearts cut out are lovely. 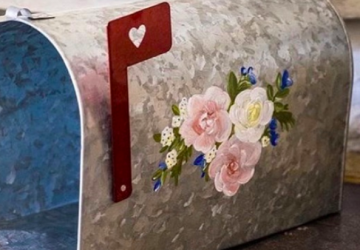 The candle light shines through the little hearts. 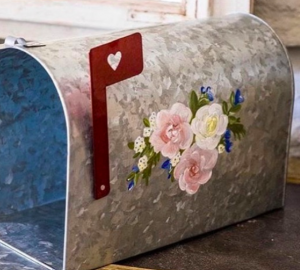 If you have anywhere to hang these they have a loop for hanging too. 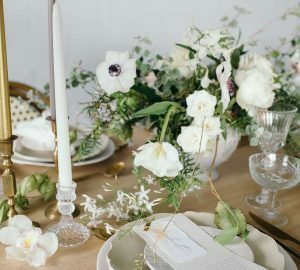 If you are looking for hanging tea light holders then these will be just perfect for your wedding. 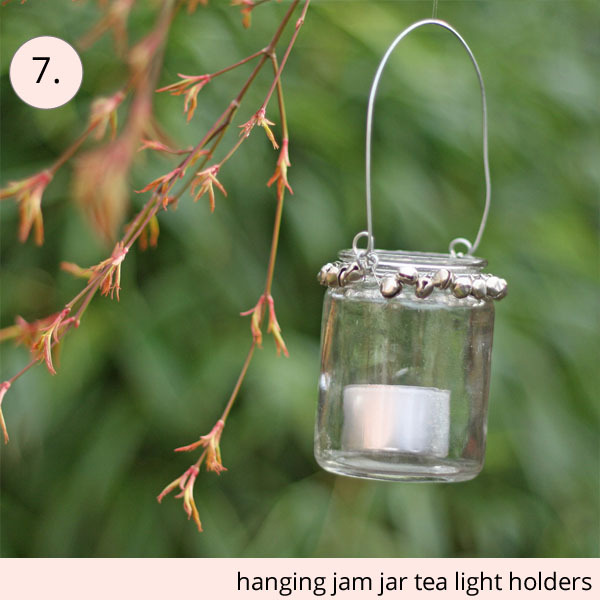 The small jam jars have a silver wire for hanging. 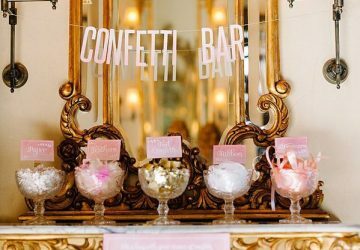 We suggest hanging from branches of trees in the outdoor areas at your wedding venue or from shepherds crooks running down the aisle. 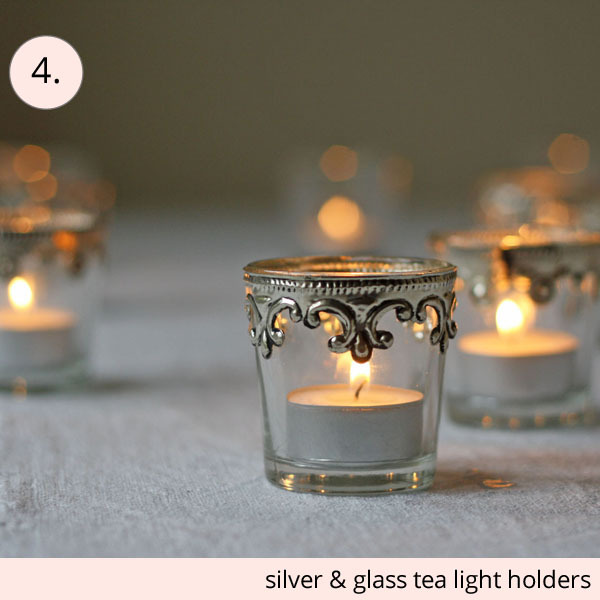 The top rim of the tea light holders have silver bells adding to the pretty look.